“I flip-flop between being super encouraged and inspired, and devastated and frustrated at the state of affairs when it comes to Indigenous stories, and how the mainstream is opening its doors or not opening its doors to the storytellers.” Continue reading. Jessica Matten is grateful for the chance to co-star on APTN’s Blackstone, Ron E. Scott’s gritty series spotlighting the issues First Nations people face on a reservation. Though Blackstone is a fictional reservation, stories of alcohol and physical abuse, and land rights are certainly based on fact. “It was awesome to be a part of a show alongside a lot of people from my childhood,” Matten says of her character, Gina. “It was a full-circle thing. And to talk about issues that really matter to me and are close to my heart was really cool to be a part of.” Blackstone was one of her first major acting roles for the actor and Aboriginal fitness company owner and paved the way to her biggest gig to date in Discovery’s Frontier. Debuting Sunday at 9 p.m. ET, Matten plays Sokanon, a skilled warrior, hunter and tracker in Declan Harp’s (Jason Momoa) Black Wolf Company, a small fur trade outfit taking business from the faltering Hudson’s Bay Company in 1700s Canada. 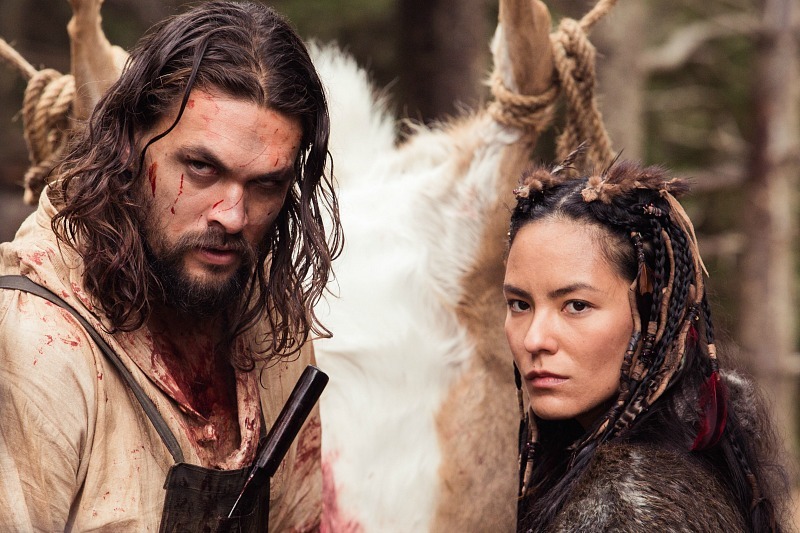 Co-created by Rob and Peter Blackie, Frontier‘s six-episode first season (it’s since been picked up for a sophomore go-round) is a sprawling, violent adventure outlining the founding of Canada. As Matten describes it, it truly was an ordeal to work next to Momoa as his right-hand. Not. “It was gruelling,” she says with a laugh. “All my girlfriends were like, ‘Did he take off his shirt? '” She wouldn’t confirm whether her co-star doffed his top, but does say he’s one of the most down-to-earth people she’s met and has nothing but good things to say about production and everyone involved. Sokanon is an Ojibway character alongside Momoa’s Declan, a Métis, and the Black Wolf Company consists of First Nations’ members coming together under his rule. A situation that occurs in Sokanon’s life causes her to join the gang, who are as much out to protect the land from Lord Benton (Alun Armstrong) and the HBC as they are to make money trading pelts. Matten likens Frontier to a Canadian Game of Thrones in that everyone is fighting for land rather than a throne. While her fellow co-star, Shawn Doyle—he plays fur trader Samuel Grant in Frontier—is used to being part of period pieces (he assumed the role of John A. Macdonald in CBC’s 2011 TV-movie John A.: Birth of a Country), Matten never thought she’d perform in a historical project because of what she calls a “contemporary First Nations look,” and recalls the irony in being cast because of her lineage. “I’m actually a direct descendant of the first Métis leader, Cuthbert Grant and Louis Riel, the nephew of Cuthbert Grant,” she says. “In a lot of ways, I feel as though I’m honouring my ancestors and this is a full-circle experience for my family. Things happen for a reason, and I really believe in that.” The battle over land rights has been an issue since the days in which Frontier is set and continue today, and Matten uses that in her portrayal of Sokanon. “As much as Sokanon is a warrior, she struggles with what Harp is doing and what is right and what is wrong,” she says. Frontier airs Sundays at 9 p.m. ET on Discovery. Last night the Leo Awards presented their gala awards ceremony — the final of three nights celebrating British Columbia’s film and television industry — and the television winners were dispersed among several shows. CTV’s whydunnit Motive won best dramatic series, beating out 19-2, Blackstone, Continuum and The Romeo Section. In performances, Jared Keeso was named best lead performance by a male for 19-2, and Carmen Moore of Blackstone won best lead performance by a female. Lauren Lee Smith of This Life was named best supporting performance by a female, with Osric Chau best supporting male for Blood and Water. For a complete list of winners, see the Leo Awards website. Prairie Dog Film + Television announced today that CBC has acquired the broadcast rights to air seasons three, four, and five of the hit drama, Blackstone. CBC previously broadcast seasons one and two as part of the network’s 2015 National Aboriginal History Month programming. Broadcast and digital platform details for the remaining seasons will be announced at a later date. Known for its “ripped from the headlines” approach to storytelling, the Blackstoneseries is a fictional yet authentic drama series that explores the raw and real dynamics of family, power and politics on a First Nation reserve. Told through the entertaining and all-too-real storyworld of Blackstone, the series delves into prevalent and present day issues affecting Aboriginal communities, including: the missing and murdered Aboriginal women epidemic in Canada, drug and alcohol abuse, domestic violence, oil and gas exploration on reserves and the devastating effects of the residential schools. While the portrayal can be dark, Blackstone is both the story of a community plagued by corruption, violence and injustice, and the inspiring story of the undying hope and resilience of people fighting for a better life in the midst of adversity. Blackstone’s award-winning, predominantly Aboriginal cast includes: Carmen Moore, Eric Schweig, Michelle Thrush, Nathaniel Arcand, Steven Cree Molison, Tantoo Cardinal, Andrea Menard, Glen Gould, Justin Rain, Cheri Maracle, Jessica Matten, Ray G. Thunderchild, and Georgina Lightning, with appearance by Jennifer Podemski, Garry Chalk, and John Cassini. Blackstone is produced by Prairie Dog Film + Television, with Ron E. Scott as Showrunner & Director, Jesse Szymanski as Co-Executive Producer, and Damon Vignale as Writer/Producer. The series currently broadcasts in Canada on APTN, in the United States on Hulu and HuluPlus, in New Zealand on Maori Television, and in Australia on SBS/NITV. Blackstone has been nominated for 86 awards, including its most recent nomination for Best Dramatic Series in the 2016 Canadian Screen Awards. Bravo’s gritty cop drama 19-2 and CBC’s high-profile comedy Schitt’s Creek topline the nominations for the 2016 Canadian Screen Awards. Announced Tuesday morning in Toronto at TIFF Bell Lightbox by Lyriq Bent (The Book of Negroes) and Aislinn Paul (Degrassi), 19-2 captured 12 nominations, including Best Dramatic Series and Best Performance nods for supporting cast and leads Jared Keeso and Adrian Holmes; Keeso and Holmes recorded a video to mark the occasion (check it out below). Meanwhile, Schitt’s Creek does battle in the comedic categories, with co-stars Eugene and Dan Levy facing off for Best Performance and the Tuesday night comedy fighting off fellow CBC series Mr. D, Mohawk Girls, Young Drunk Punk and Tiny Plastic Men for Best Comedy Series. Space’s Orphan Black did well too, snagging 13 nominations including performance acknowledgements for Ari Millen and Tatiana Maslany, though it was shut out of the Dramatic Series list. Global’s final season of Rookie Blue was recognized by the Academy of Canadian Cinema & Television, as Missy Peregrym and Ben Bass received nominations. The nominees in the key television categories are listed below. Who do you think deserves to win? The two-hour Canadian Screen Awards gala airs Sunday, March 13, at 8 p.m. on CBC. The rest of the television categories can be seen here. As previously announced, comedian Norm Macdonald will host the 2016 event. Wendy Crewson—currently starring on CTV’s Saving Hope—will receive the Earle Grey Award for acting and Martin Short will be honoured with the Lifetime Achievement Award. The Canadian Screen Awards air Sunday, March 13, at 8 p.m. on CBC.